GNS figures there’s about a 1/120 annual risk of something of similar size hitting Wellington: 0.833%. Post-earthquake recovery policy in Christchurch was its own separate disaster. The morass of agencies and regulations contributed to what I’ve called a confusopoly: nobody knew what they were allowed to do because they needed to get permissions from too many outfits, none of which really knew what they were doing. I’m not speaking hyperbolically here. There is reasonable risk that, after a Mercalli VIII event, Wellington will cease to exist as a city. Here’s the path to failure. It doesn’t have to play out this way, and I sure hope it doesn’t. But it’s more likely than I’d like. Government replays Christchurch, with a poor governance setup for a recovery agency. Everybody knows Christchurch didn’t work well; nobody’s prepared for anything else so they go with the current off-the-shelf option, which is a do-over. Nobody has put sensors into key buildings before the earthquake that would let us know how far beyond design spec key parts of the buildings moved, so engineering assessments will take a long time. Downtown gets cordoned off for months while they figure out which buildings are too risky. The Lambton/Featherston core is under cordon for at least half a year, maybe more than a year, during engineering assessments. Safe buildings cannot be reoccupied because everyone’s worried about the other ones that could fall on the safe ones and so it’s army barricades again. Little priority is put on regime certainty: government announces a review of building standards following the earthquake, and no buildings over two stories are allowed pending that review. So even those places that could be safe to build on aren’t built on. Essential government functions will have to leave quickly to be able to get on with things, and there won’t be enough available safe commercial space here to move people into. The business core will relocate, possibly to Auckland, possibly elsewhere. 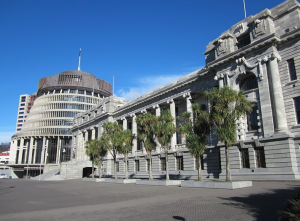 The tech core and Weta don’t need to be here – they could relocate anywhere. There’s a coordination problem in figuring out where the tech sector would go, but a Schelling point might just be to follow wherever Xero goes. Christchurch makes sense as a city: it’s a regional service centre for a broad agricultural periphery with a good university and an important port. If Christchurch didn’t exist, you’d have to invent it. So even though government made a complete hash of the downtown recovery, it was going to come back because there was a reason for it to come back. It’s harder to see that for Wellington, even if you can’t beat it on a good day. ew Zealand government “Beehive” and the Parliament Buildings. Wikimedia Commons. I hope that the current government puts some priority on it. We’re still playing Russian Roulette. The revolver’s barrel has 120 chambers, one of them has a bullet in it, and we pull the trigger every year. We have the chance to build a Kevlar helmet to blunt the bullet’s effect if we get an unlucky draw. Kevlar ain’t perfect, but it helps reduce the risk. As postscript, I worry a lot about uninsurable risk. The odds each year are small, but if it happens, there are losses against which it is currently impossible to insure. Homeowner insurance and income protection insurance don’t cut it. There are no Case-Schiller indices that could let you buy options that would act as insurance. There isn’t any obvious stock portfolio that would track. And there are no retail-level parametric insurance products that take even the simple form “Pays $x if a Mercalli VIII event hits Wellington in 2018; pays $0 otherwise.” The fair price of that contract is 0.833% of the contract’s price; I’m more than happy to pay a reasonable margin over it to lay off that risk. But contracting costs are too large for anyone to offer this contract to just me, and too few people would be willing to pay say $8300 per year for a contract offering $500,000 in case of earthquake. Not that I’ve been offered a quote – that’s just a doubling of the fair price to reflect a cost of risk transfer. Absent any substantial demonstration of people-other-than-me being interested in buying it, it’s worth nobody’s time to even offer a quote. I’m not worried enough to flip to being a renter rather than a home-owner, but I do wish we were closer to Arrow-Debreu worlds. Hopefully, blockchain parametric insurance options will get us there. 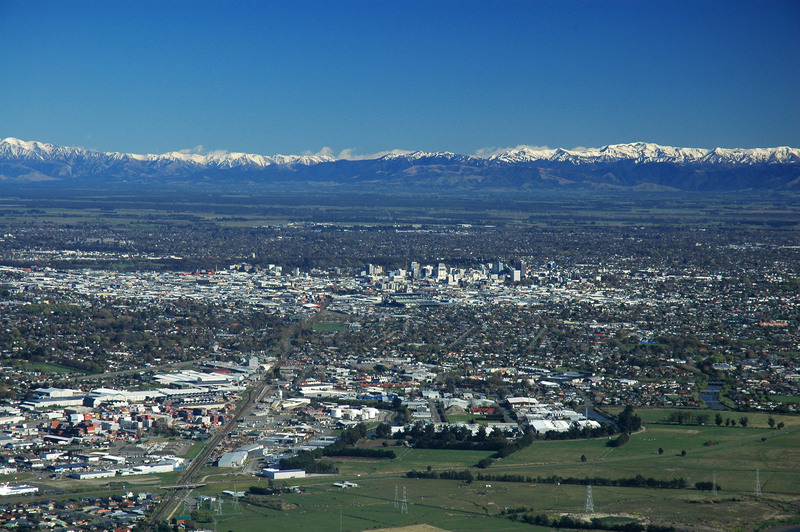 Image: Christchurch City (New Zealand) from the Port Hills. Wikimedia commons.